at the Edouard Mossot High School. go to Mouila, the provincial capital of Ngouni?. moreover, simulated in his backpack. panther teeth and several elephant hairs. obtained them from his accomplices. Gabon has been developing its natural aptitude for tourism and conservation for some years now. Formalized new national parks and protected areas; gradually becoming accustomed to some groups of gorillas for tourist visitation, improving support infrastructures and logistic, inviting private partners to invest …. However, it has failed to reshape its Environmental Protection Laws. 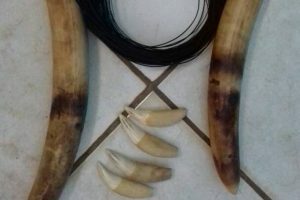 In this case, the young hunter and dealer was caught with two tusks of elephants, if he had twenty tusks of elephants his maximum penalty would be the same six months. Judges in Gabon usually apply penalties that are very close to the maximum allowed, bumping into the ineffectiveness of punitive measures. Reviewing your laws is essential. Yes – sentences very low and out of sync with the profits to be made by smuggling. Lots of corruption in the police and army, too, which aids smuggling. Not helped by Cameroonian smugglers being heavily involved in poaching in Gabon, including elite units of the Cameroon army.